So why the need for the authentication of a Corot painting or one painted by anyone else for that matter? Simple: To secure the integrity of art history, protect the artists name and all he stood for and sustain the values, both ethically and financially of his oeuvres. Here then is a prime example of how authenticating or should we say 'attributing' a work of art to a man like Camile Corot can be so patently and obviously wrong. Even though multiple experts (it is alleged) all agreed the painting was by him. What they missed was the most obvious and logical of all facts. Instead, they pinned everything on opinion alone. The most dangerous method in the world, yet one still followed by the majority of principal auctioneers. Relying soley on an experts personal opinion. Or: What we are told is provenance. He considered it to be "an authentic Corot". 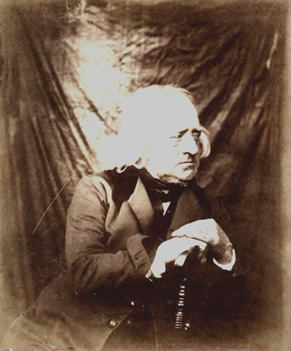 Then on November 1, 1920, Commander Professor Frederick Hermain, superintendent of a Gallery in Rome, considered the work authentic for Corot, though we are not told which gallery and he is untraceable. By November 7, 1920 it is seen by another 'expert' who considers that the work is authentic. But we are not told who! Then on November 14, 1920, Professor Povede sees it and also considers and determines the authenticity as being correct. That is that it is a genuine Corot and further, estimates its value as more than 100,000 Italian lire. Then in 1941, the Professor of the Artistic Academy, Bartoli, has judged the work as an authentic Corot too. All of these facts and the names of those purported to have felt this way is not corroborated. To give the provenance even more clout, this alleged Corot passes through Messrs Phillips and Co in London at auction in 1922, catalogued as being Jean-Baptisie Camille Corot. Presumably because they too bought into the provenance and did not check it fully? Sadly all records and archives do not exist it seems. As far as the provenance is concerned, a huge mass of conjecture prevails with the story concerning its origins, none of which adds up. Content sold artisits materials for a living and stretched and pre-primed and coated canvasses for Parisian artists. 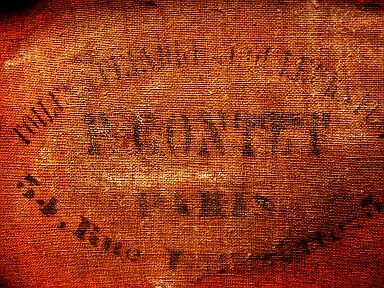 The stamp above rightcorresponds to that of the stamp shown below, which we know is a legitimate Pissarro oil of around 1890. 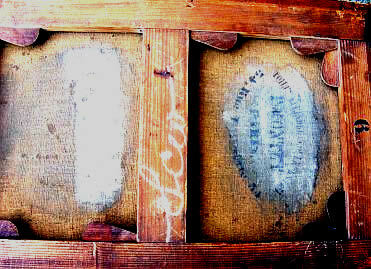 It is the stamp Paul Contet used for each canvas he primed and stretched in his workshop. Both stamps appear this way around (see bottom right) indicating that the canvas was prepared as a standard portrait or figure format for the time, with the weave going one way. But both canvasses have been turned through 90 degrees and used as landscape canvasses. This was normal at the time as Portrait canvasses were more expensive and landscape less so, so economics prevailed. The address is important here, seen as 34 Rue Lafayette, Paris. It was the former site of the Gallery Latouche, previously owned by artist Louis Latouche and his wife, who after 1875 ran the gallery on her own. Her husband by now had gone back to concentrating on his painting. The important fact here is that record has it that Mrs. Latouche sold the business in the year 1886, not before. 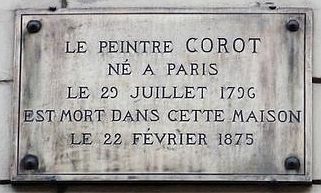 So one can safely assume it was to Mr. Paul Contet, as certainly it wasn't Contet's shop before that date! So why is this simple fact so important, after all the Provenance mentions Monsieur Latouch and his friendship with Corot? Well the experts all immediately put 2 and 2 together and make this a thousand by deciding this painting is a genuine Corot and primarily because of that fact, the provenance assumes it is and none of them wanted to be seen to be wrong or go against the grain! So not much has changed there then !!! But it is not a fact, it is guess work, assumption at best and conjecture and in Authentication there is no room for either. So why then is it not a Corot when so many say it is? Jean-Baptiste-Camille Corot died on February 22nd 1875. That's a full eleven years BEFORE this stamp ever appeared on the canvas and eleven years BEFORE this canvas or stamp ever exisited. It may be a bit obvious to you, but why on earth for all these years has this fact been missed or worse, ignored? Corot Authetication CASE STUDY - COROT FAKE; When is a Corot not a Corot? 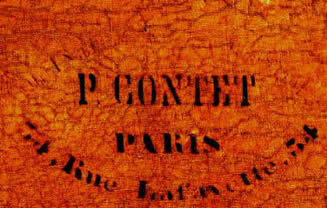 Corot Art Authentication Experts - Identification of Corot Fakes & prosecuting COROT ART FRAUD. 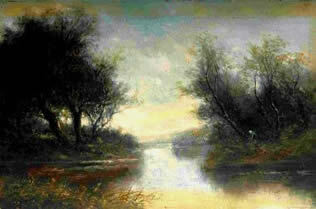 JEAN BAPTISIE COROT oil painting investigations, authentication and provenance research Art Fraud Investigators. List of Corot's Pupils; List of Corot's oil paintings. KEYS/ Header; Corot Art Authentication Experts | Jean Baptiste Camile Corot's signature, identifiation of fakes, authentication services list oil paintings | Corot's Pupils, landscapes, portraits,identification of fake and fraud. List of Corot's Pupils; List of Corot's oil paintings.